In the world of vintage steel guitars, National has it over everything else out there. And this National Grand Console model, is one of the best-looking, killer-sounding steels you're ever going to find. First appearing in 1947, the Grand Console was the National model that Fender "borrowed" from, in designing their Stringmaster steels, introduced in 1953. This unbelievably fine twin 8-string model is, for being over 60 years old, in near excellent condition. The Lucite board overlays are in Mint condition . The colored totem-pole markers are just as bright and shiny today as when the instrument left the factory in Chicago in 1953. The pickups – with individually adjustable pole-pieces – are bright and punchy. In all, this is an astonishing, all original find, (except tuner buttons) that's going to make an impressive addition to your repertoire. 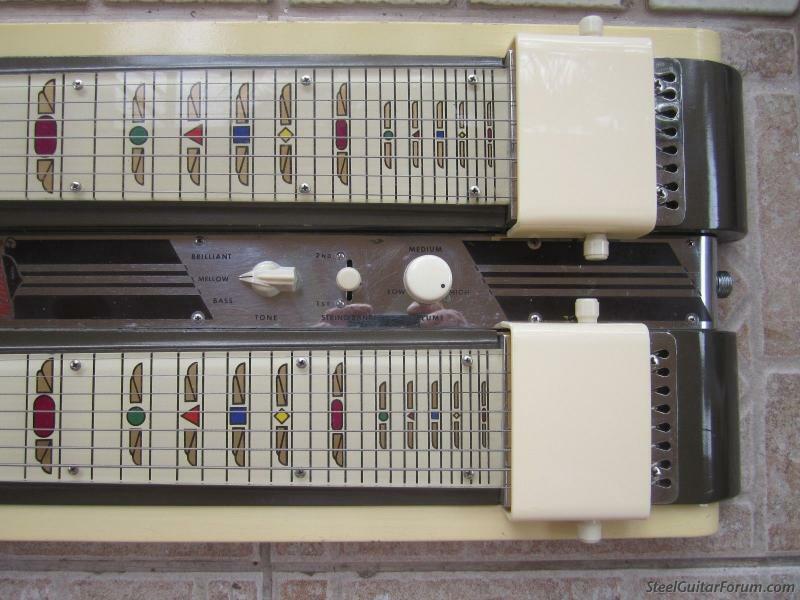 There were originally two versions of the Grand Console – this, the model 1051, with an elevated outside neck, and the model 1050, with both necks somewhat more awkwardly placed at the same level. Similar to a normal guitar's pickup selector switch, the Grand Console features a "silent bank switch", giving you the choice of one neck or the other, or both at the same time, and National's then exclusive "touch control" providing three tone options, of Bass, Mellow, and Brilliant. A sweet sounding 8- string lap steel that is great for C & W and Western Swing styles.This model was also favored by lap steel blues legend Freddy Roulette, so it is not limited to country sounds at all. All original pickups and electronics function as they should. 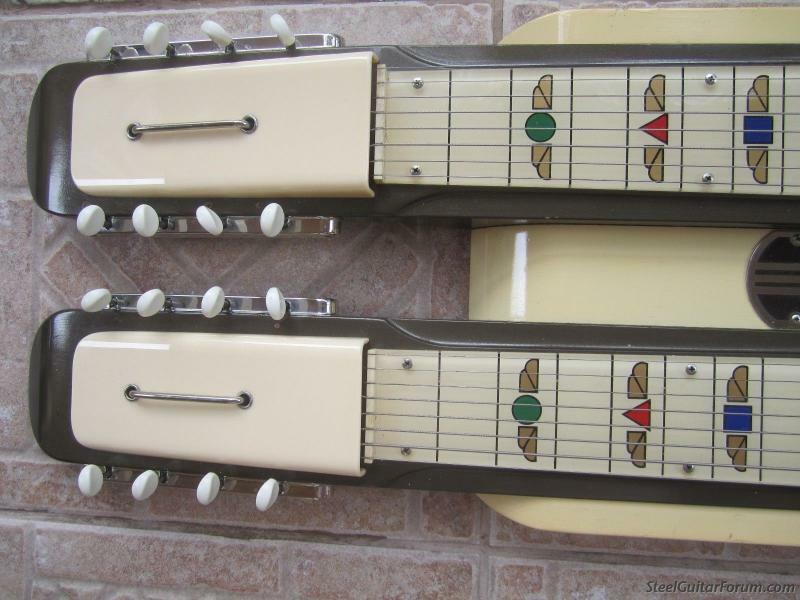 Overall this vintage lap steel is in rarely seen great condition. Posted 10 Aug 2018 6:30 pm Beautiful guitar! I'm curious to know what sources support your statement that Fender "borrowed" from the National Grand Console when designing the Stringmaster. I didn't know that. Not looking for a spirited debate (although those are often inevitable), I'm just looking to build my knowledge base. I don't think that "spirited debate" needs to be in the Classified Ads section. 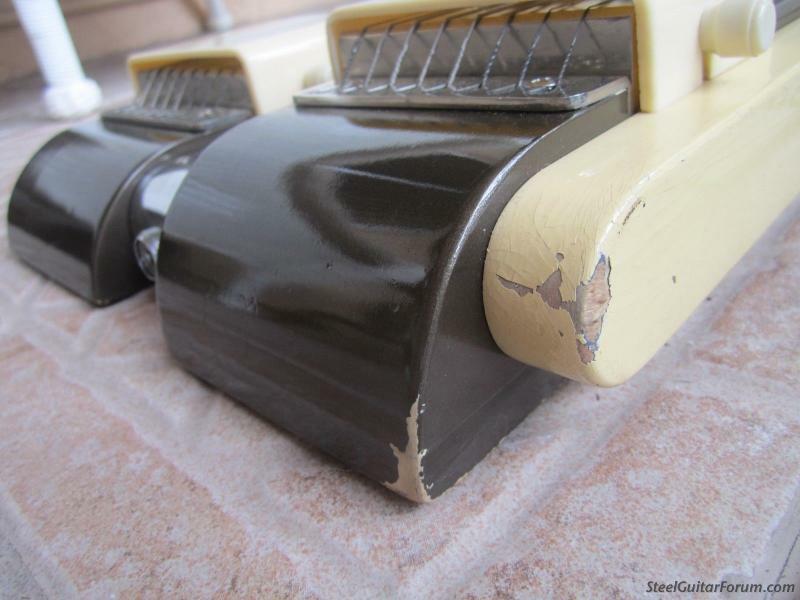 Feel free to start a new topic in "Steel Without Pedals" if you're so inclined. A classic steel guitar at a nice price. Someone should grab this one. They aren't making them anymore. Posted 10 Aug 2018 10:49 pm Weight? How much does it weigh, with the case? Would be good for anyone who needs to ship (or lug from gig to gig) to know.